It’s just spent a week over 90 in Minnesota, a month after the last snowstorm, so it’s definitely time to start thinking about ice cream. 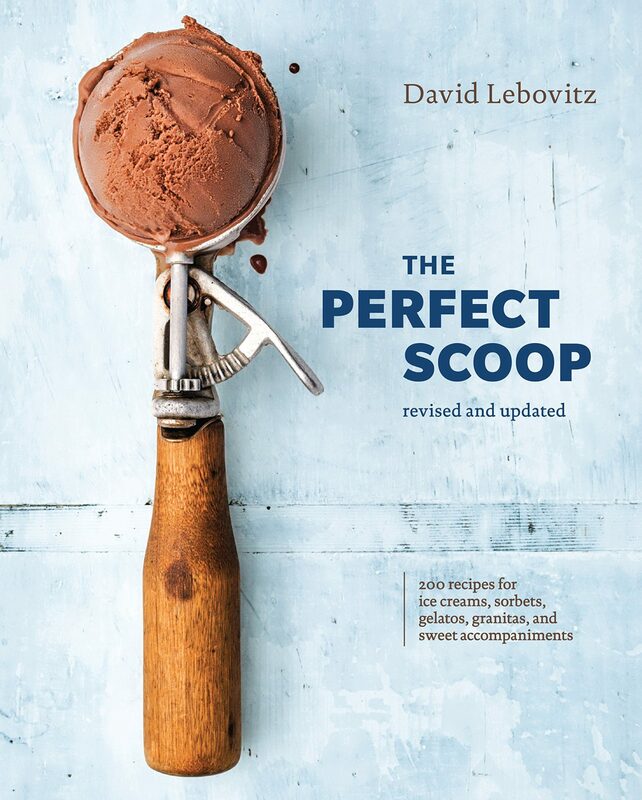 If you have made ice cream at home, you have probably at least heard of David Lebovitz’s The Perfect Scoop, originally published in 2008 and generally considered to be a seminal text on the topic. The author is also very generous with sharing recipes on his blog, so even if you haven’t purchased the book, chances are you’ve at least read over his recipes. I’ve owned The Perfect Scoop for about five years now, which is as long as I’ve owned an ice-cream machine, and I’ve made a good dozen recipes out of it. Lebovitz’s vanilla ice cream isn’t necessarily my favorite vanilla, but his caramel base is to die for, and his avocado ice cream—yes, I said avocado ice cream—is simply the best. This year, for the book’s 10th anniversary, Ten Speed Press has put out a revised and updated edition of The Perfect Scoop, and of course I had to nab a copy so I could see all the differences. If you’re not familiar with the first edition and just came here for ice-cream recipe testing, click here to jump to that part! If you did read the first edition and want to know what’s new, keep reading here. First, the non-recipe-related changes. There is, of course, a new introduction. All of the flavor text—that is, the cute stories and tips and tricks—has been revised and edited, although rarely substantively. The author’s recommendations on brands and companies to buy from have been updated to better reflect 2018, such as Amazon being listed as a supplier in the back, and a lot of the pictures have been replaced with . . . different pictures of the same thing. (I’m not sure why they did that in particular, but they did.) If you’ve read Lebovitz’s blog before, you’ll know that he’s got a little bit of that American-who-moved-to-Paris snobbery going on. I find it charming, but your mileage may vary, and the snobbery is a touch toned down in the second edition. What do all the recipes left out of the second edition have in common? Most of them are more savory (and a little out there, in the case of the green-pea ice cream). If you’re interested in some of these strangely savory flavors, then it’s probably worth tracking down the first edition, perhaps in a library, to have them on hand. You’ll also notice that a lot of the new recipes for the second edition are sticky sweet, and a few more of them are alcoholic, especially the new sorbets and granitas. Lebovitz indicates in the introduction that it’s to better reflect current tastes, especially those of Americans, and I don’t think he’s necessarily wrong. And now, for the best part of any cookbook review: Stephanie makes one of the new recipes! 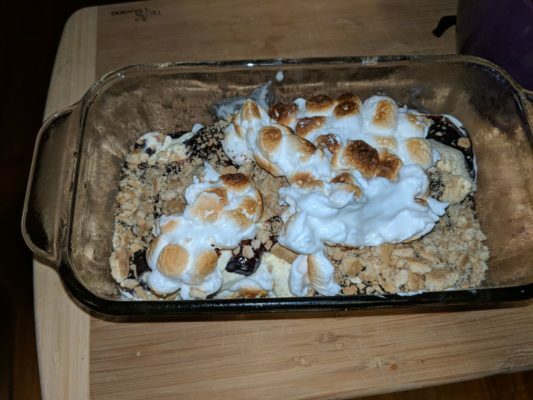 I’ve decided to make the s’mores recipe, since I ran them all by my spouse and he promised to eat more than half of this one. Lebovitz has previously put the recipe for this ice cream on his blog, available here, if you’d like to see the official wording and pictures. Protip: Before making your ice cream, put the bowl of your ice-cream machine into the freezer. Wait 2 to 3 days until it’s frozen. You’re welcome. 1. 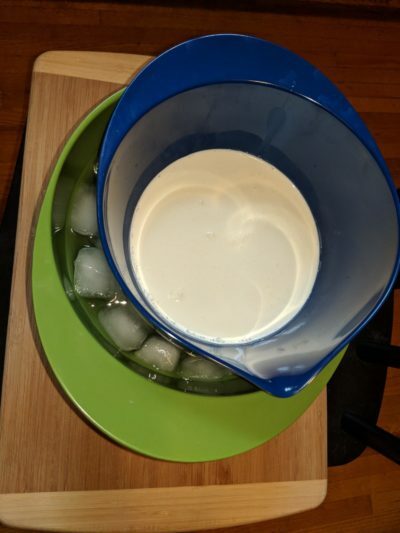 If you’ve made ice cream before, this is basically “make a vanilla ice-cream base.” If not, here are some better directions: Make an ice bath by putting a 2-quart bowl or pan inside a larger bowl you’ve partially filled with ice and water. Strain the cream into the bowl and leave the strainer on top of the bowl. Set aside. This is the completed base in the ice bath, but that’s the ice bath. 2. Lebovitz recommends doing one thing (see his version), but I prefer the Julia Child method of custard making, so that’s what I used. Put the egg yolks in a bowl—save the whites for something like this—then beat them with a whisk or a hand mixer until they’re a lighter yellow. Add the sugar, beating until they turn a nice lemony color. I’ve abused this poor Kitchen-Aid three-speed mixer so badly over its lifetime. 3. Warm the milk up on the stove with the salt in a slightly oversized pot until it’s hot to the touch, then dump it into the egg mixture in a thin stream, very slowly, until you’ve incorporated it all. This is much easier if you put the milk into a measuring cup with a spout, like this one. 4. 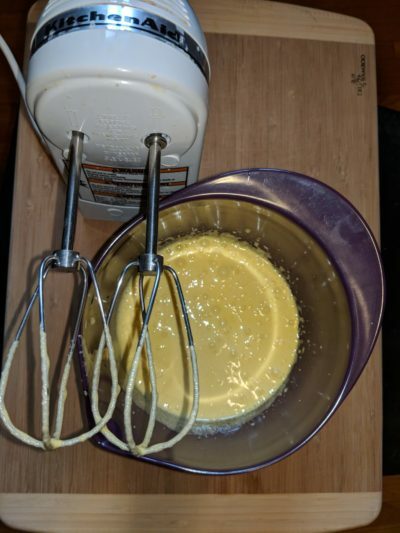 Return the egg-sugar-milk-salt mixture to the pot and heat over very low heat for about 5 to 7 minutes, stirring constantly with a heatproof spatula, until the mixture thickens slightly. It should be about this thick. 5. Strain the mixture into the cream in the ice bath and stir until as cool as you can get it. Add the vanilla. 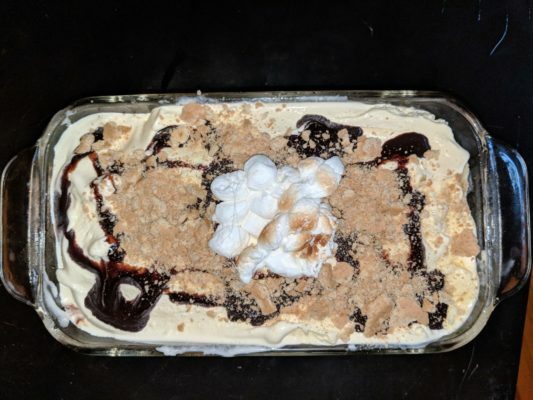 The texture should be, well, pretty much the same as melted ice cream, for obvious reasons. Put it in the fridge overnight or in the freezer for about an hour, depending on your level of patience. Save the ice bath for the next part. 1. Put all the fudge-ripple ingredients except the vanilla extract into a small saucepan and whisk it until smooth, then heat it until boiling. Turn the heat down a little and let it simmer for a minute, then remove it from the heat and add the vanilla. 2. Either put it in the ice bath from the base that you correctly didn’t discard yet or cover it and throw it in the fridge or freezer until cool. 1. As every single ice-cream recipe will tell you, freeze the base in your ice-cream maker according to the manufacturer’s instructions. Also put the container you’ll be storing the ice cream in into the freezer to chill—I used a 1.5-liter loaf pan because I thought it might look cool, but I also have quart-sized paper ice-cream containers. 2. While the ice cream is in the machine, torch the marshmallows. Sadly, I don’t own a crème brûlée torch, and my spouse refused to get out the welding torch for this (Julia Child would have done it, okay?! ), so I used the broiler. 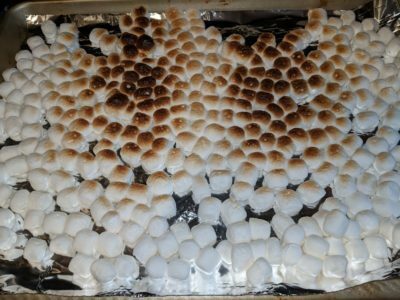 Be careful not to overbrown the marshmallows, even if, like me, you usually just set them on fire when eating actual s’mores. Use a silicone baking mat or some other nonstick surface. Don’t use parchment or foil, which is what I did—they stuck. 3. When the ice-cream machine is done, layer the ice cream as follows: fudge ripple, graham-cracker bits, mini marshmallows, ice cream, repeat. How thick the layers are depends on your particular container. Try not to stir it, because you want there to be pockets of fudge. You also may want to work quickly; otherwise everything will turn into a mess. As a note, I only used about half of the mix-ins, alas. I was right: the loaf pan did look pretty good. 4. Delayed gratification! Stuff it into the freezer until it’s firm enough to scoop. Soothe your sad feelings by licking the spoons. So, if you’ve never made homemade ice cream before, is this book a good place to start? Definitely. Lebovitz lays out everything in the beginning with numbers and pictures and as many separate steps as possible. It’s clear he’s trying to make homemade ice cream as accessible as he possibly can, and the new edition only helps. For example, he’s moved the reminder to put the frozen bowl in the freezer before you start, preferably two or three days before, as the instructions say, rather than the very last step. Lebovitz does, of course, have the usual admonitions about using the highest-quality ingredients that one can. Ice-cream making isn’t a cheap hobby; for one thing, you need an ice-cream maker, and while I’ve had luck finding them for as low as $4.50 at a thrift store, it’s much more likely that you’ll be paying $35 to $50 for the bog-standard Kitchen-Aid variety. He even makes the case for paying for one of the compressor variety, which can run up into the thousands of dollars. The ingredients aren’t necessarily cheap, either, since most recipes require a pretty good quantity of heavy whipping cream. Ingredients alone probably run in the range of $4 $10 a pint range, so you can’t even argue that it’s economical, unless your previous ice-cream budget was entirely Izzy’s. However, it’s fun, it’s satisfying, and it feels a little like magic. What ice cream would you make out of the recipes in this book? If you had the first edition, are you sad that the green-pea ice cream was left out?